On production worksites where a high degree of quality is required, more and more manufacturers are employing soldering systems with digital temperature display functions. Meanwhile the importance of the soldering temperature control is increasing. Aimed at reducing human error (such as errors made when measuring and logging temperatures), HAKKO’s tip temperature thermometer with traceability control provides reliable, simple and appropriate support for the tip temperature control process. By eliminating the need to log the measured temperatures manually and computer input work, it’s helping to achieve labour savings in tip temperature control. It notifies the operator when to stop measuring the temperature. Measurement is finished when the “H” mark stops blinking and is steady lit. Automatically detects measurement errors and prompts the operator to perform the measurement again. 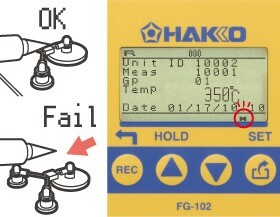 The screen displays “Fail”, if the tip is removed from the sensor before measurement has finished. 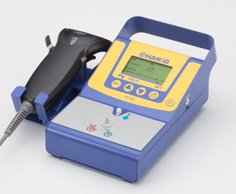 Main units can store up to 300 measurements and send data to PC via USB. (Data logged in CSV format, USB cord included). If not in operation for a certain time, the unit automatically enters into power save mode. Storing the scanner in the holder cuts standby power to reduce battery consumption. Requires no power supply and features a handle for excellent portability. The compact design provides easy movement on the worksite. Groups can be created based on different operating temperatures, according the nature of the job. An automatic pass or fail judgement can be made even if different set temperatures are used. The unit automatically counts the number of measurements, to indicate the time of sensor replacement. The unit automatically notifies the next scheduled calibration date, when it is registered.